We had the good fortune to come into contact recently with one of the first residents of McLean Gardens, Bea Shaheen McPherson, who was a map maker with the U.S. Army Map Service during World War II. In 1943, Bea Shaheen moved from her temporary living quarters at the U.S. Army barracks in Arlington, Virginia to Eustis Hall at McLean Gardens as soon as it opened. It was one of nine dormitories built for war workers where she shared a room that cost $37.50 per month. The dormitories were located where Vaughan Place now stands, and they were designated for either women or men. Before coming to Washington for the war effort and being employed by the U.S. Army, she learned cartography at Kent State University in Ohio. Since men were being sent to the battle fronts, the Federal Government recruited certain universities to offer courses in map making in order to fill the vacant positions; women with majors or minors in geography and/or mathematics were in demand. Two of Bea’s most vivid recollections of her experience at McLean Gardens during the war are the gorgeous magnolia trees that were outside of her dorm windows and the overall elegance of everything at McLean Gardens. Some of the magnolia and other trees and shrubs were from the Friendship Estate, which ceased to exist by the time of her arrival. The architectural detail and beauty of the buildings and grounds were appreciated, especially in the Ballroom. She recalls John Paul Jones dances there, jitter bugging, and good times; the dances were held for the single men and women who lived in the dormitories. Married couples and families lived in the apartments, as they were called then, that existed in the historic 31 buildings that remain. According to Bea, not all of the first residents were war workers or in the military. She remembers a fellow who was a teacher at Sidwell Friends School who lived in one of the 31 buildings with his family. There was a lounge in each of the dorms that she described as a very inviting living room, where the ladies could meet with gentlemen — but the gents were not allowed in their rooms. The rooms that she described as being like college dorm rooms had two beds, a dresser, a desk, and a sink, and each floor had a bathroom. The streetcars were in operation then, so she and the other map makers in her group would board a streetcar to get to their office on MacArthur Boulevard. Overall, her memories of the time spent at McLean Gardens are very warm and lovely — despite the unpleasantness that WWII brought. Thank you, Bea, for your participation in our neighborhood art and history project! With deepest sadness we share with you the news of the sudden passing, on January 31, of Robert L. Beisner, who was a valuable and highly-respected member of the Art on Call Committee. His long-time loyalty and commitment to our project was an integral part of our ongoing work, and it was a genuine pleasure and honor to have known and worked with him. Before his retirement, Bob was a professor at American University and became the chairman of the History Department. He was also the president of the Society for Historians of American Foreign Relations. As a prizewinning diplomatic historian, he was best known for his exhaustive work, “Dean Acheson: A Life in the Cold War,” an 800-page biography of the former Secretary of State. He received his master’s degree and doctorate in history from the University of Chicago. Given his life-long love of history, he was so perfect as a member of our history and art organization. We will miss his warm smile, sense of humor, and enthusiasm. 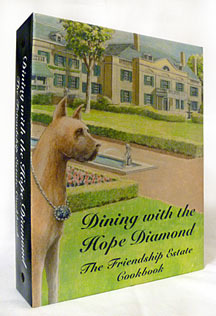 Dining with the Hope Diamond—The Friendship Estate Cookbook is available for purchase. If interested, please contact the Art on Call Committee at info@friendshipestate.org. Proceeds benefit the historic call boxes for the McLean Gardens neighborhood. Residents of McLean Gardens have contributed their tastiest tried-and-true recipes into a keepsake book that will be treasured for generations to come. This cookbook contains 400 mouth-watering recipes—everything you need from appetizers to desserts—and it costs $29.95 and $4.50 for domestic shipping and handling per book. If two or more cookbooks are purchased, a $5 discount per book is applied after the first book is purchased at full price. • A section devoted to recipes to make treats for your beloved pets. 2. Mr. and Mrs. Edward B. McLean and Mr. and Mrs. John R. McLean each had a set of custom-made china with a Friendship Estate theme. What was the theme? 4. Which McLean dog is believed to have worn the Hope Diamond at the Friendship Estate on special occasions? 5. How many McLean Friendship Estates were there, and where were they located? 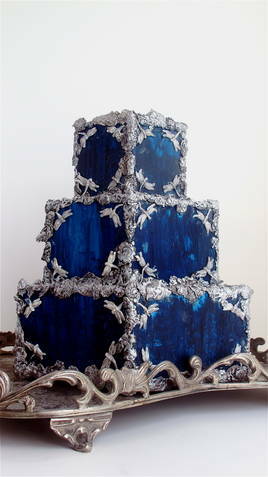 The Hope Diamond cake (photo above) was created especially for our cookbook by internationally-renowned cake artist Maggie Austin LaBaugh (http://www.maggieaustincake.com/). Maggie has also donated her amazing recipe for Apricot-Glazed Almond Cake with Honeyed Mascarpone Cream, available here: Maggie Austin Cake Recipe. Deepest gratitude to Maggie and Jessica, her Managing Director, for their generosity and kindness in donating high art, beauty, and a great cake recipe to our project! Exciting news: Artist John Bailey, who painted the beloved Marilyn Monroe mural on Connecticut Avenue, created a portrait of Evalyn Walsh McLean and the Hope Diamond for our cookbook. We snapped this photo of him holding it in the folder on our “close-up of Marilyn adventure” we had with him. To purchase a copy of our cookbook now — just e-mail us at info@friendshipestate.org. The recipes that we have tested from our collection of 400 thus far have been fantastic!